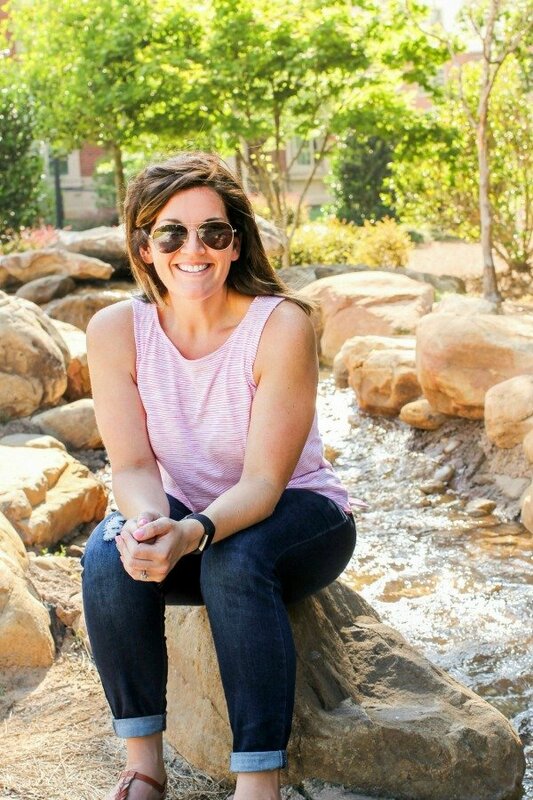 August 20, 2017 By Allyson 11 Comments This post may contain affiliate links. Read my disclosure policy. Chocolate Covered Pumpkin Cheesecake Truffles are a super delicious dessert that are perfect for fall and the holidays! I love cooking with pumpkin, and even after ‘fall’ starts, I like to keep cooking with it. You may recall my One Pot Creamy Pumpkin Pasta or my Pumpkin Coconut Curry Soup, but this recipe is brand new, and everyone is going to flip over it! 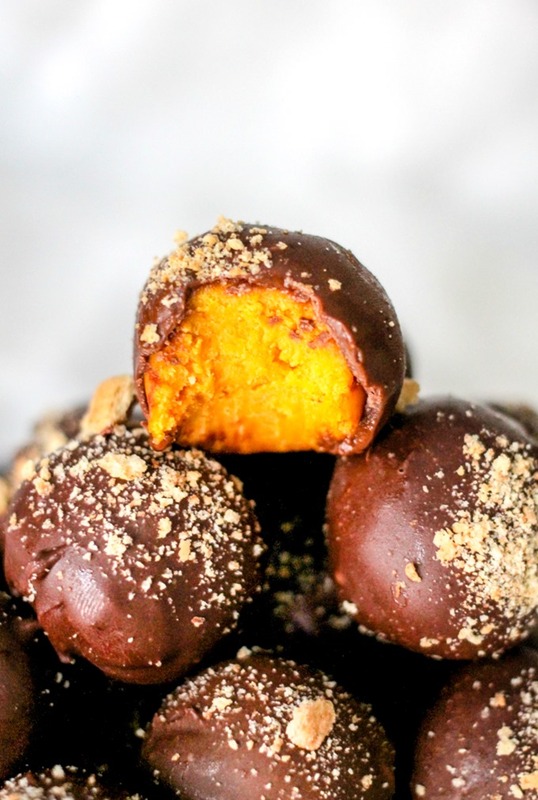 Using only a handful of ingredients, these Chocolate Covered Pumpkin Cheesecake Truffles will be making everyone’s mouth water at your next event! You HAVE to try them! I also made a step by step video so you can see just how simple these are to make; check that out below! Once you have the goods, the rest is easy. Mix your canned pumpkin with your white cake mix (JUST pumpkin and cake mix, do not add anything else), and then bake that bad boy up. Once it’s done cooking, crumble it up, and toss it into your stand mixer. Add a block of softened cream cheese and let her rip! Once everything is mixed together, roll the batter into little balls, and place them onto a baking sheet. Pop it into the freezer for about an hour, then take it out and get ready to cover them! Melt your chocolate chips and then dunk each Pumpkin Cheesecake Ball into the chocolate, and then set back onto the baking sheet. Crumble a bit of graham cracker over the top, and then on to the next! Keep going and going until you are finished covering all of them, then pop those bad boys back into the freezer for at least 2 hours! Boom, Chocolate Covered Pumpkin Cheesecake Truffles, DONE! 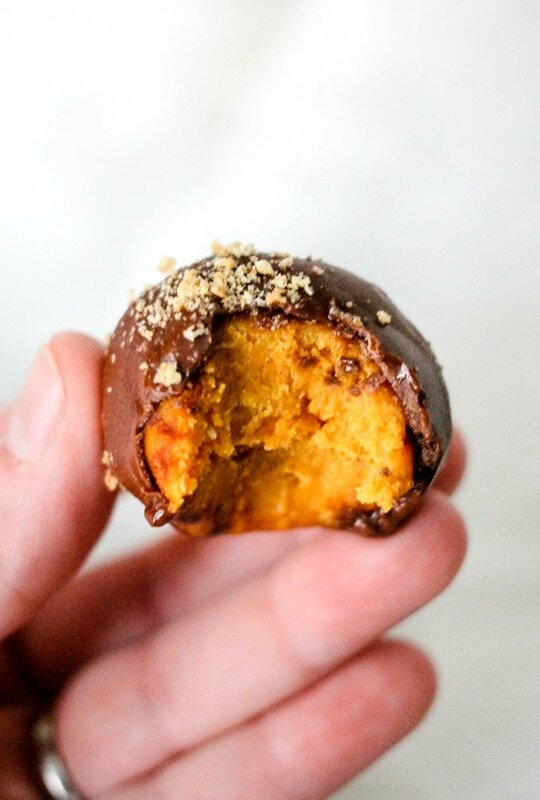 Chocolate Covered Pumpkin Cheesecake Truffles are so so tasty and super easy! They keep for a long time in the freezer/fridge too, so you could make them ahead of time and then bring them to a party when you need them! How easy is that! Preheat oven to 350 degrees. In a large bowl, combine pumpkin puree and white cake mix (do not add any other ingredients, just he bag of the white cake mix) until completely combined. Spread mixture into a 9x13 baking dish, and place into the oven. Bake for 25-28 minutes or until done. Carefully crumble up the baked cake mixture (you can wait until it cools, or use the oven mitts-careful not to burn yourself!) until all broken up, and dump into the bowl of a stand mixer (can also use hand mixer). Add cream cheese, beat on medium until the cream cheese is completely incorporated into the cake and it's a pliable dough consistency (shouldn't take more than a few mins). Line a baking sheet with parchment paper. Scoop out dough in about 1 TBS rounds, rolling into a ball with your hands. Continue until all dough is used. Place into freezer for 30 minutes. In a medium microwave safe bowl, melt your chocolate chips: Microwave for 30 seconds, then MIX with a fork or spoon. Place back into microwave for 15 seconds, remove and mix again. Continue in 15 seconds increments until melted and MIX in-between increments. Once melted you can add 1 TBS shortening and this will thin the chocolate allowing easier coating. Dip each pumpkin truffle into the chocolate until covered, and using a fork allow the extra chocolate to drip off (see video); set covered truffle on parchment and sprinkle graham cracker crumbs over the top. Repeat for all truffles. Place into the freezer for at LEAST 2 hours to allow the chocolate to firm up. Serve. When not serving, keep in the fridge or freezer to prevent the chocolate from melting. -See video for step by step instructions. 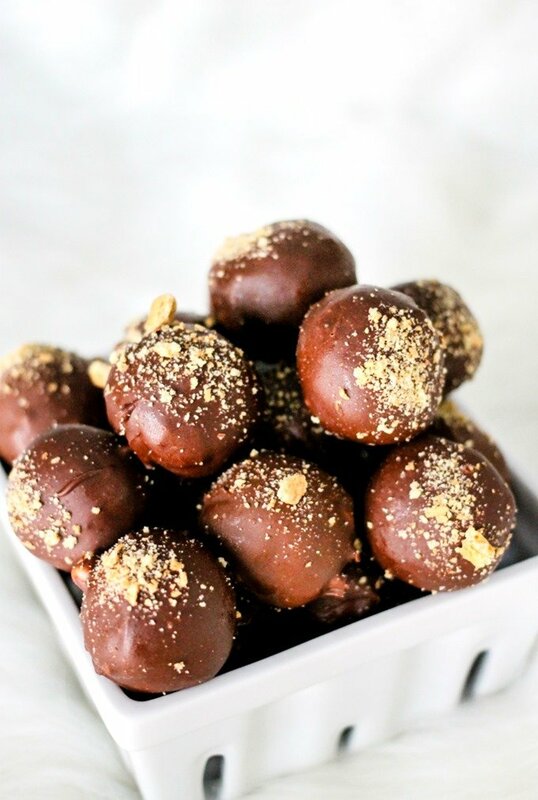 - Be sure to add graham cracker crumbs after every one or 2 dipped truffles. Once the chocolate hardens, the crackers wont stick anymore! It should be a 15 ounce can of pumpkin. The can you used is too much! I love the idea of having these in the freezer just waiting for whenever I have a craving! Bring on fall and all things pumpkin! This looks like the perfect treat to start the season!! These look like such a fantastic Fall dessert!! These are lovely little fall goodies! You could serve these for tailgating or Halloween or Thanksgiving, or Tuesday night 😉 They look fab! These truffles look heavenly! Can’t wait to try them! What a great recipe to kick off Fall soon! I love these! How many truffles does this recipe make? 30+ depending on how big you roll them!